Updates are in reverse-chronological order, hop to the bottom and scroll up. And that’s a wrap! Operation Sting 2017 is over and I couldn’t be happier with the results. I went 3-2 in my games but I took home the hardware for Best Appearance. I am at a loss for words. 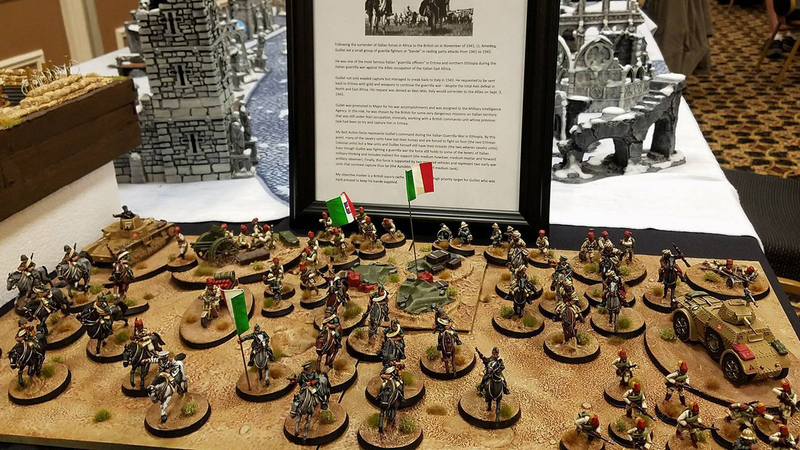 The competition was fierce, there were several incredibly painted armies and I was happy to be in the running, shocked to be honored with the top award. Next up, Adpeticon in March. I’ve already got a few ideas for the next project and it’s going to be something special. Operation Sting 2017 is off to a roaring start. All those late nights painting are paying off as there is nothing like seeing fully painted armies facing off on gorgeous tables. I ended the day 2-1 and can’t wait for the next day. Two-day tournaments like this are some of the best gaming experiences I’ve had but man, are they exhausting. The inexperience cavalry are done! As the midnight hour approached I added the final touches to the objective marker and with that, my Operation Sting 2017 army is complete! It really cam down to the wire, much closer than I would have liked, but, I was able to finish just in time! And now, off to the tournament. With only three days until Operation Sting I have kicked into hobby overdrive. The remaining items on the to-do list are these six colonial cavalry, an objective marker and the display board. I’ve got three evening left to get to get it done. With Operation Sting right around the corner I am back to speed painting. 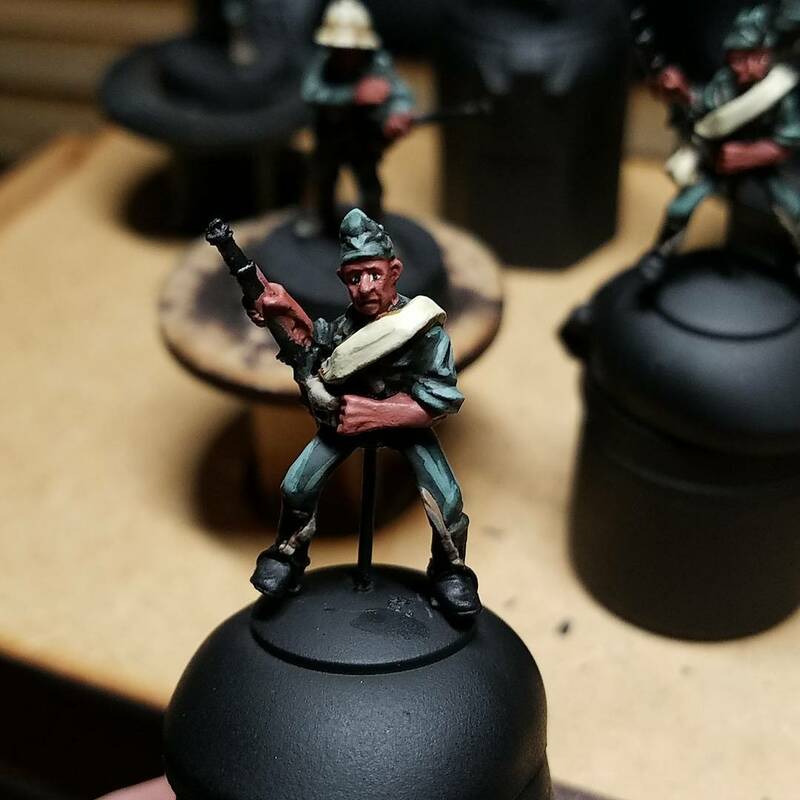 I made serious progress on the second colonial infantry squad and am cutting a few corners compared to the first unit. I am not painting eyes, simplified the webbing and the rifles. I will have this batch of five finished tomorrow and should be done on the next batch (only four) by the end of the weekend. 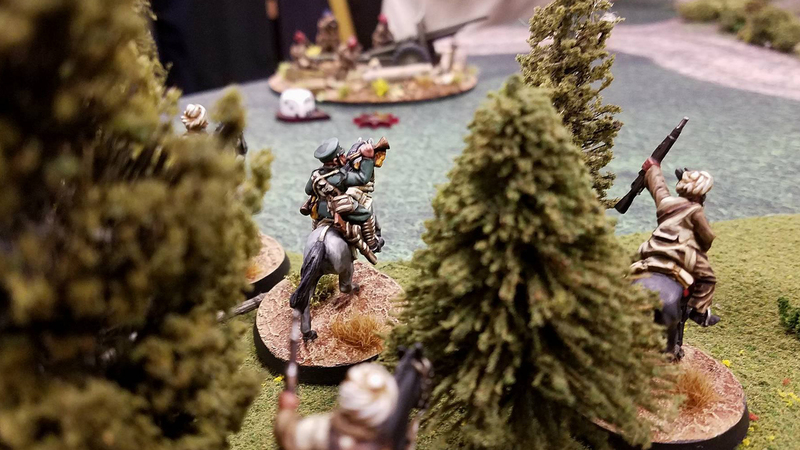 I just barely completed my 1,000 point list to attend the Bolt Action tournament at Dragon Fall 2017 over the weekend. These were the first tournament games I’ve played with the Italians and it was a learning experience. The list I am running contains two large units of cavalry and two large units of inexperienced riflemen. These are two major differences from other armies I have played and I am only now coming to grips with that. There are just two weeks until Operation Sting and I need to get another 250 points painted for the tournament. Sting is one of the premier Bolt Action events of the year and I want to make sure everything is set. Only the basing the left on the final batch of horses. Because of the time constraints (Dragon Fall is only four days away!) I decided to do another batch of black horses. I think I will still have a good variety; five brown, ten grey, eleven back and one white. I would have preferred to do this batch brown but it takes significantly more time. I also did not add any white or grey marking to this batch to save time so no blaze or socks on these ones. I will go back and add those details after Dragon Fall. To finish this 1,000 point army I only need to paint eight more veteran cavalry riders, the platoon lieutenant and his attendant. Should be doable in three days…I hope. Spent the night working on the three vehicles. They are close, just a few more hours of work and the M11/39 tank and Autoblinda and artillery tractor will be done. As soon as they are completed I will start another (the last!) batch of horses. I am keeping the vehicles to a basic standard with a flat basecoat and sharp edge highlights. There are a few places where the highlights are not as crisp and I would like but there is no time to go back and correct. Jury is still out on the weathering. Another productive day. I finished a group of four more grey horses and the white horse for the Lt. I made significant progress on the three vehicles as well. The M11/39 tank and Autoblinda and artillery tractor should be finished tomorrow night. I am focusing on a sharp edge highlight on the vehicles, picking out all of the rivets and taking extra care on the stowage. I am note sure if I will add any weathering or not at this point. This is also the first time I have mounted Bolt Action vehicles on bases and I really like the look so far. I might carry that through on my next army as well. Big hobby session today. I finished the five vet cav from earlier this week, got the three vehicles airbrushed with Agrax Earthshade and built these nine wall sections. The walls are from the Warlord Games Stone Walls kit. Per the Italian army special rules, if I play as the defender during a game, I am allowed D3 fortifications. Each consisting of three wall sections, up to six inches long. I cut bases out of plasticard for each section and then went to work building the individual wall sections. The Stone Walls kit offered many different combinations so each sections looks unique. 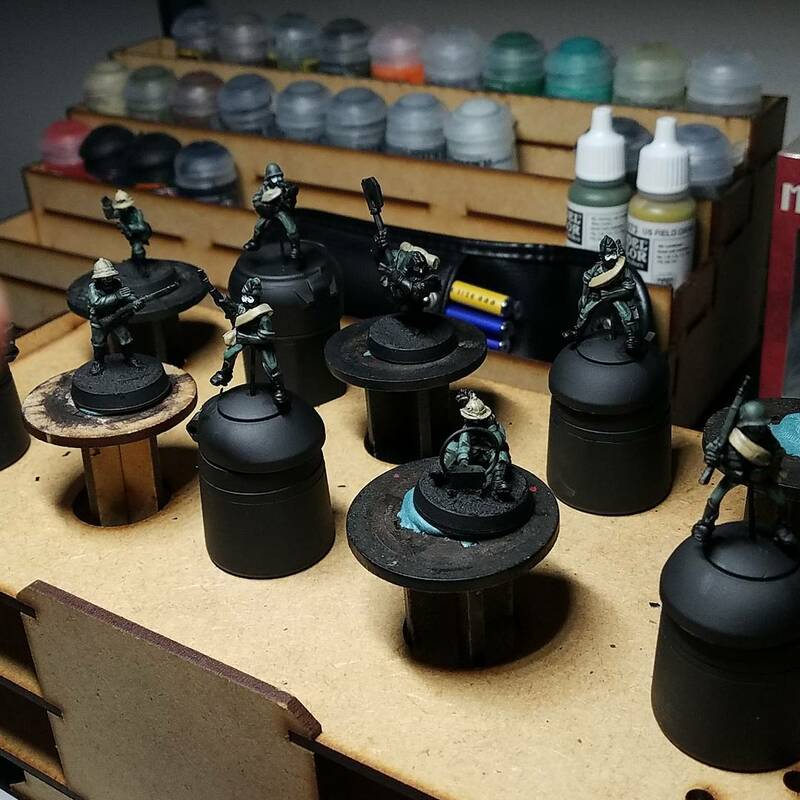 I add the Vallejo Dark Earth texture to the bases to match the rest of the army and they are ready for priming and painting. Solid progress on the second half of the first veteran cavalry squad the medium howitzer during tonight’s DnD session. One more cavalry squad to go after these. Busy weekend with not much time to hobby. 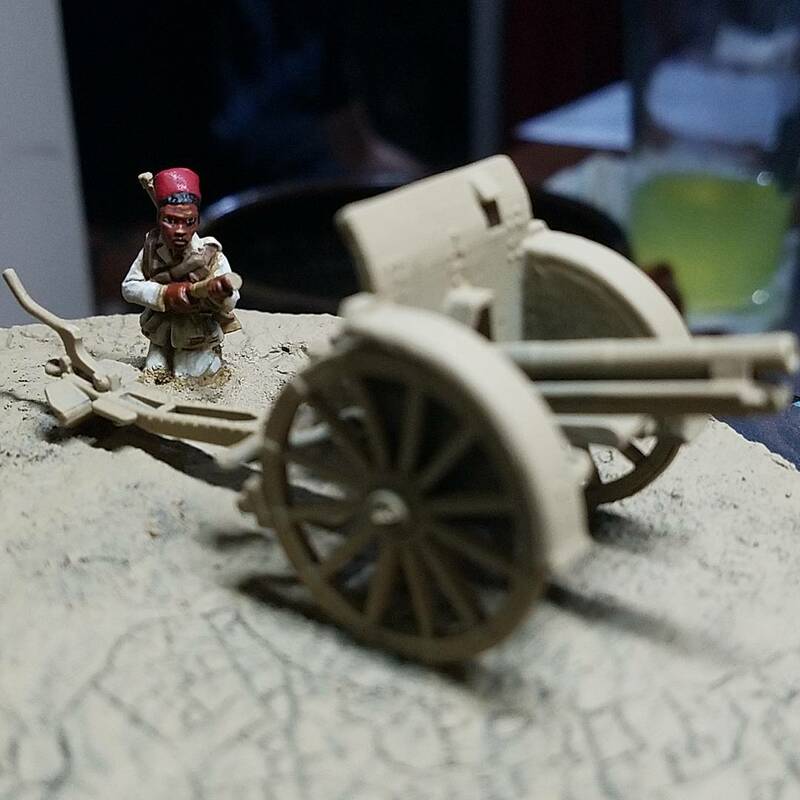 But, I was able to complete the Empress Miniatures medium howitzer and I am happy with the final product. The base looks a bit barren, even with the addition of an ammo crate and a tool box, but the army is set in the east-African desert. 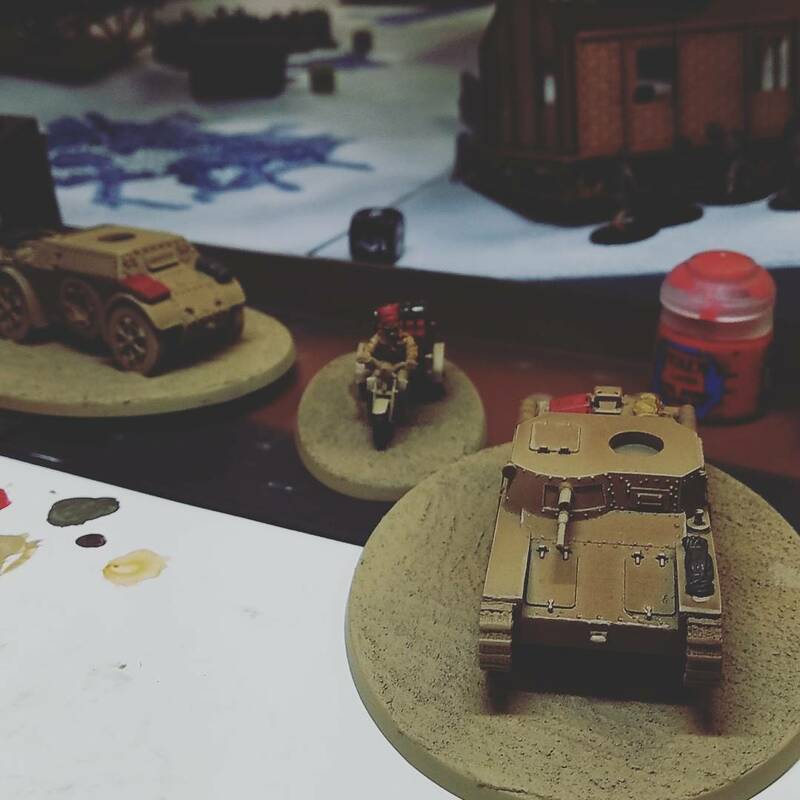 I also mounted the M11/39 tank and Autoblinda on bases, applied the basing material and basecoated them both in Zandri Dust. The next step is an Agrax Earthshade wash over the entire model via airbrush. After that, a bit of weathering and then I’ll pick out the details. First session on the medium howitzer during the weekly DnD session. I am shocked how quickly this one is coming together. The crew has a surprisingly small amount of kit and that is making quick progress. I might be able to finish the crew tomorrow and the gun should not take long. The kit is from Empress Miniatures Italian range with a simple head swap to the Gripping Beast Senegalese to match the other weapons teams. I am also using the 95x120mm Desert Basin base from Secret Weapon Miniatures for the team. I was out of town over the weekend and did not get a chance to hobby. But I was able to finish the first batch of five cavalry and attached them to the horses. I am thrilled with the results but concerned with how long it look to get them finished. 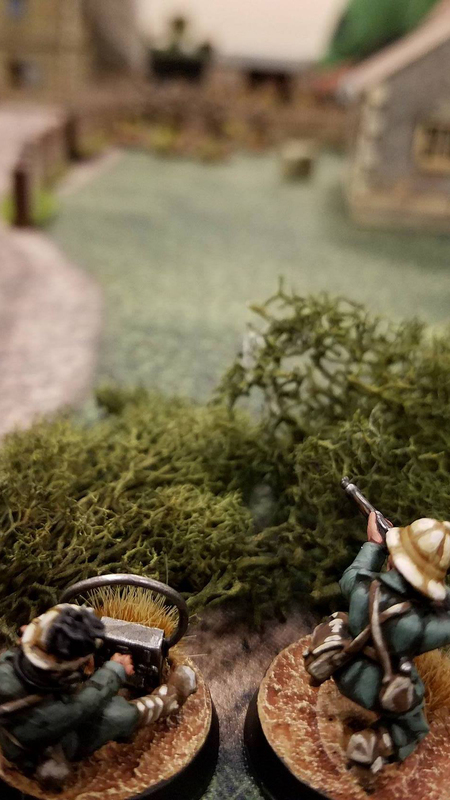 The two colonial troop NCOs and the forward artillery observer are also done and only need some static grass. Finished the skintone and the khaki highlights during Tuesday’s DnD session. Next up is the rifles followed by the metal bits and then this first batch of cav will be done! Only 25 more to go! 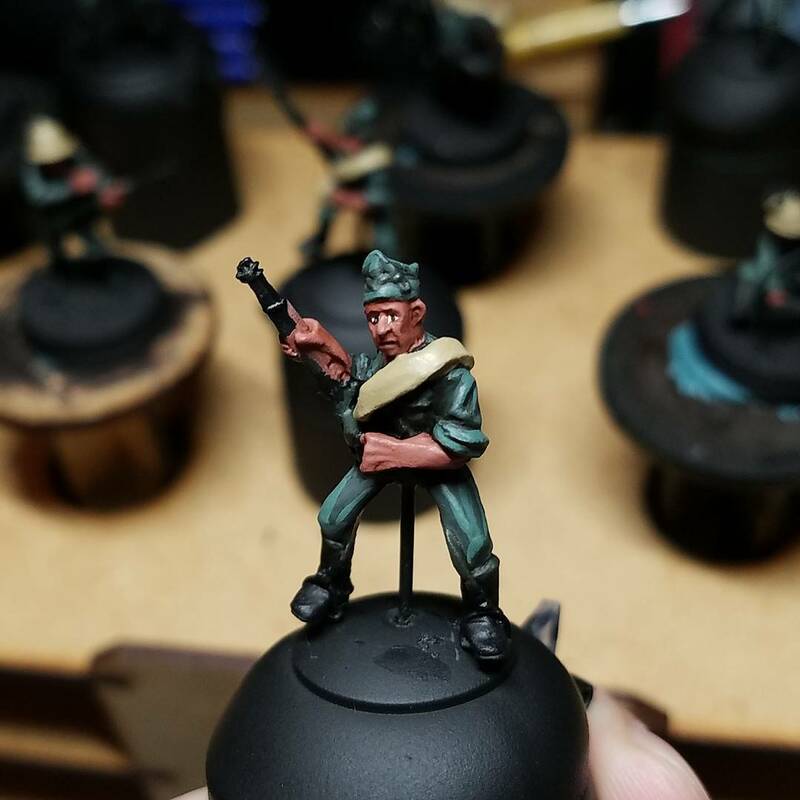 Minimal progress tonight but I did complete the khaki on the bedrolls and the first highlight on the wedding. The wedding will match the tack on the horses and will provide a clear connection between the two separate aspects of these cavalry models. Still working on the first batch of cav riders. The uniform is complete, the bedroll and wedding have been basecoated and washed. The bedroll is following the same scheme as the uniforms of the colonial troops and should tie the two units together nicely. More progress on the cav riders and colonial troop NCOs. I am still working on the uniform, there needs to be more ‘pop’. Because of the humidity I was not able to prime, hopefully this weekend. Vallejo Dark Earth texture added to the third unit of Empress Miniatures SCW cavalry (I’ll be using them as Italian cavalry). 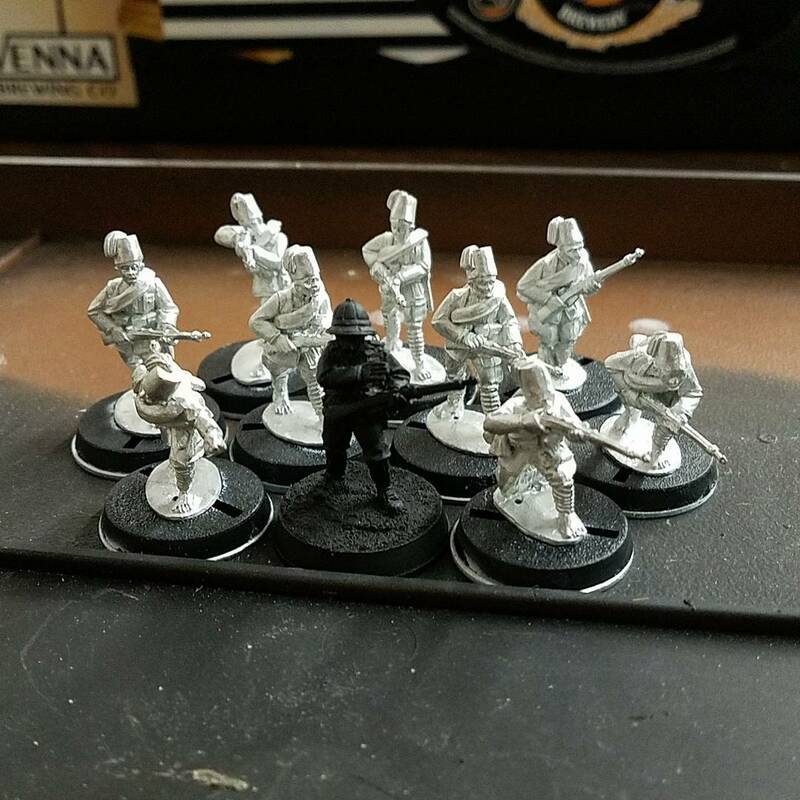 I also finished the few steps on the first batch of green uniformed cavalry riders, squad NCOs and the forward artillery observer. As I am working on a new uniform color scheme it is taking a bit longer to finalize the process. 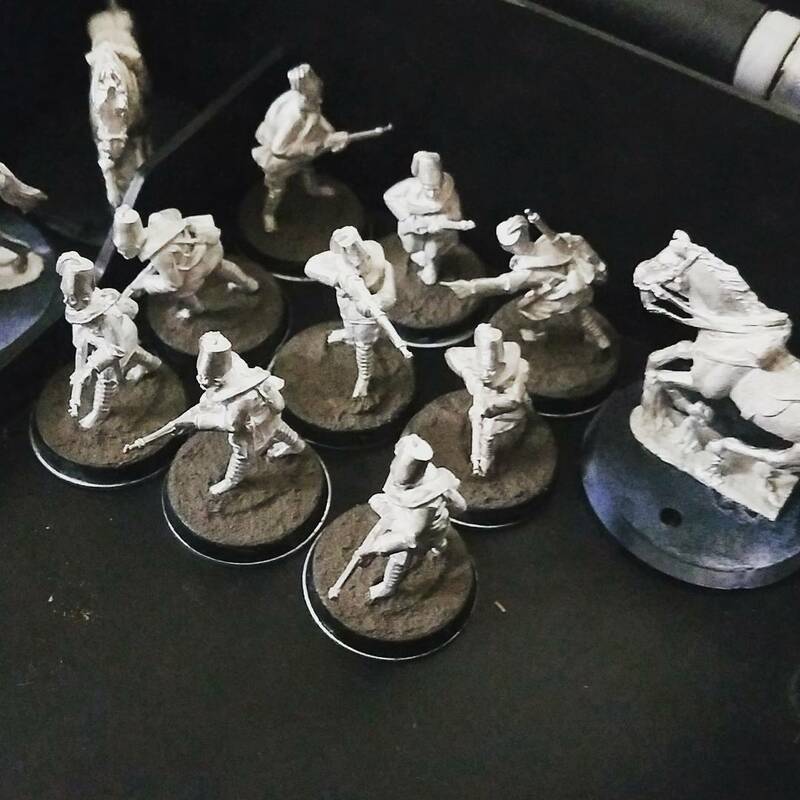 Next up, priming the colonial troops and cavalry and continue painting the riders. A bit of progress during our weekly DnD night. 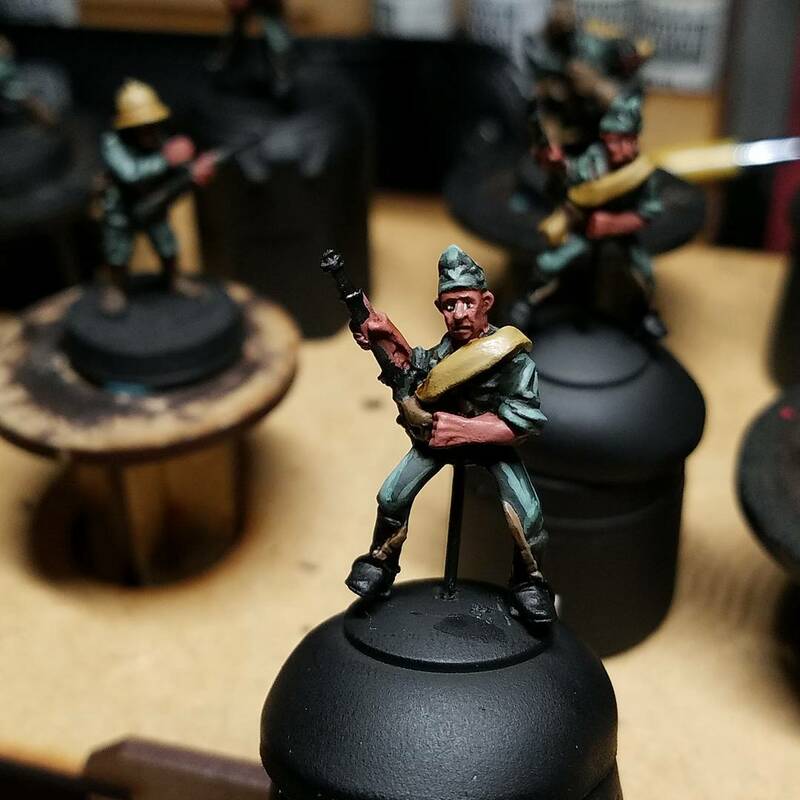 The second Empress Miniatures Askari colonial troops squad are now based with Vallejo Dark Earth texture and ready for priming. I also cleaned and mounted the last eight horses to their bases. 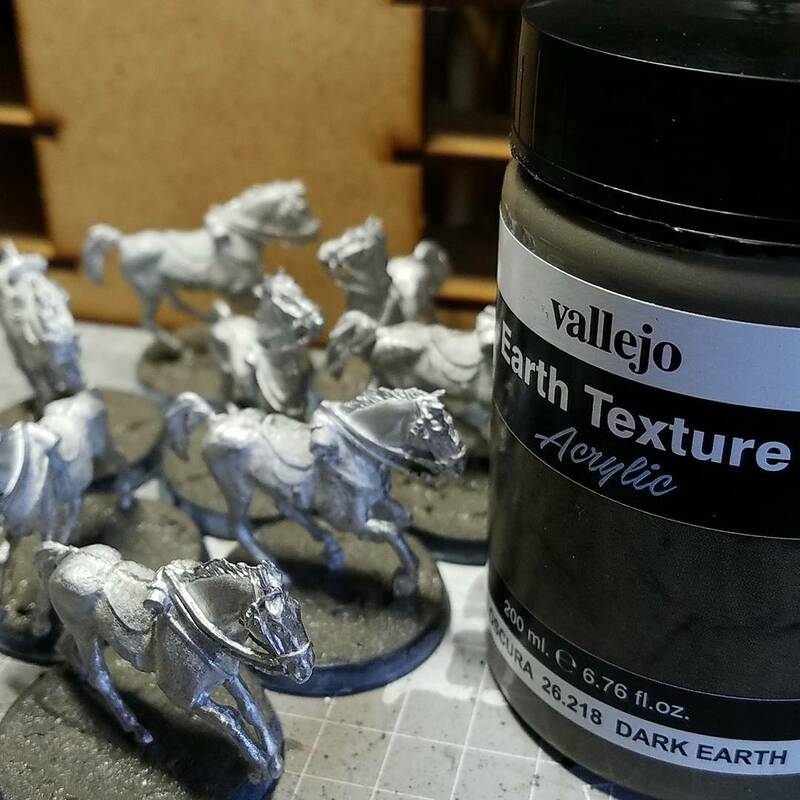 Next is adding the basing material to the horses and getting them primed as well. 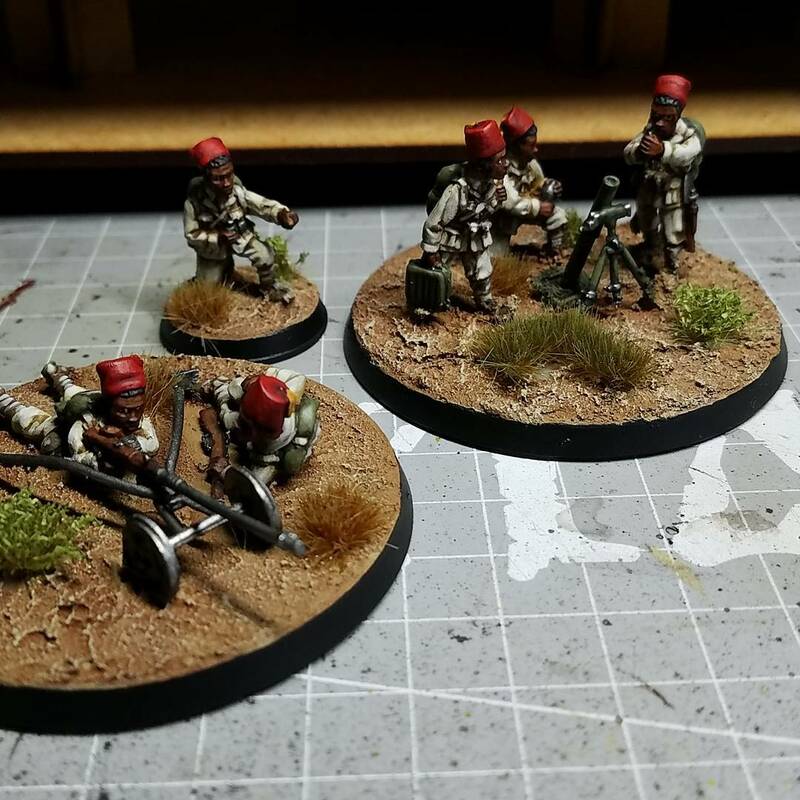 I finished the medium mortar, spotter and anti-tank rifle team. 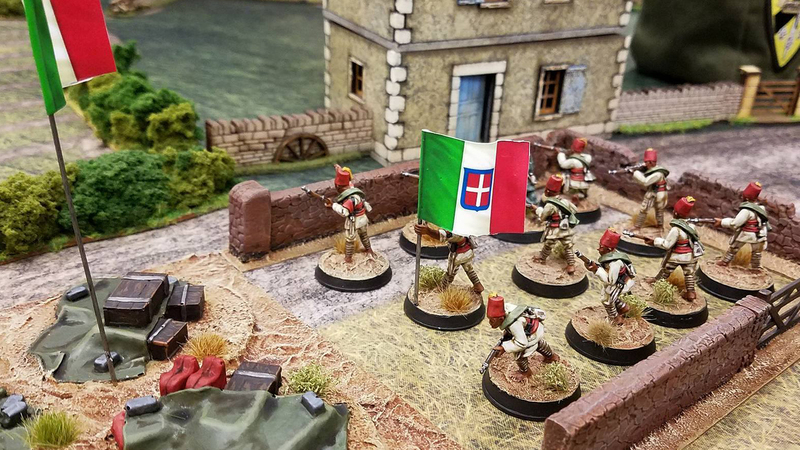 The simple headswap from the Warlord Games Italians to the Gripping Beast Senegalese tie these support weapon teams to the rest of the army. 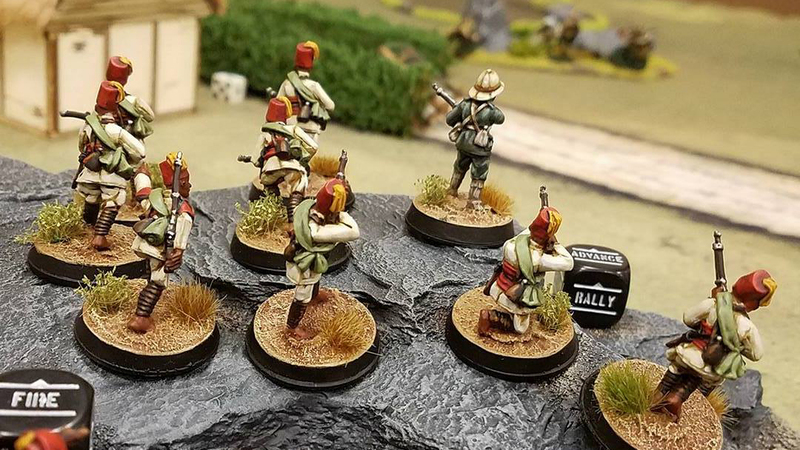 I also built the second squad of colonial troops and cannot recommend the Empress Miniatures Askari enough. Next up is added the Vallejo Dark Earth texture to the bases before priming. Taking a break from horses and working on support teams. 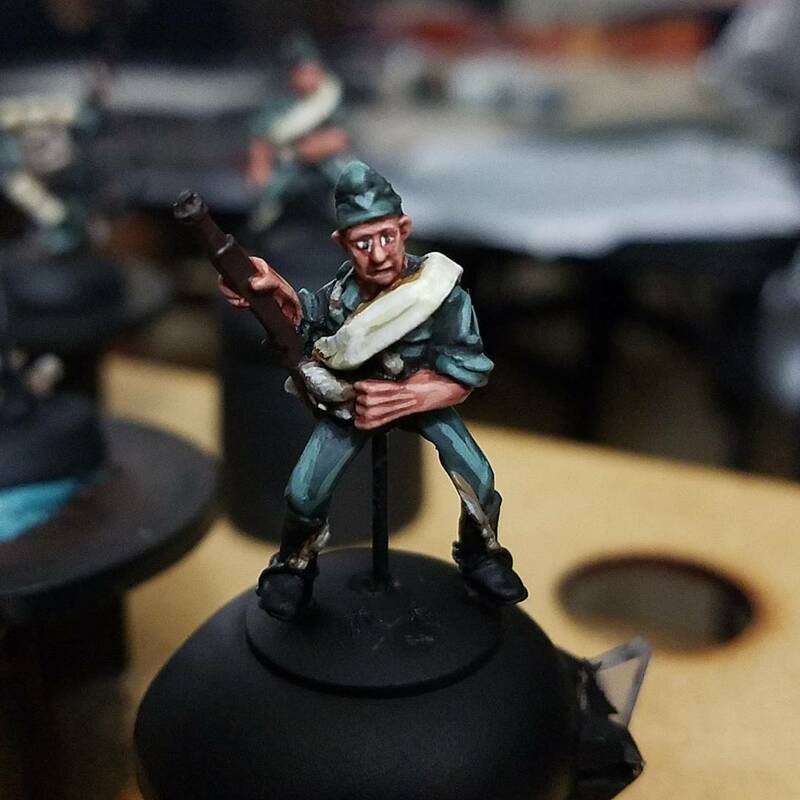 My goal was to finish the medium mortar, spotter and anti-tank rifle teams on Sunday but I called it for the night with only four steps left. I should be able to finish on Monday night. All that is left to do is final highlight on the metallic bits with Ironbreaker, drybrush on the bases with Ushabti Bone, rim the bases in Abaddon Black and attached some static grass.